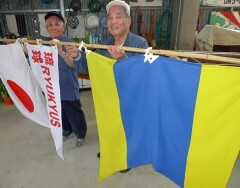 Arakaki (on the right) and Matsumoto recall the incidents, holding up the Ryukyuan colors - the one (on the right), which was established in 1950, and the other, which has been used since 1967 at Itoman Uminchu Kobo (Art & Craft Center) in Nishizaki Town, Itoman City on May 13. Ships that navigate the high seas are officially required to display a national flag, but under the U.S. military administration, until 1967, ships from Okinawa were not permitted to hoist either a Japanese or American flag. 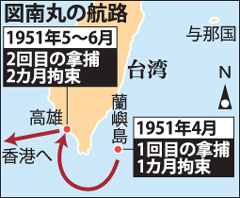 This led to numerous incidents in which Okinawa vessels were treated as being of unidentified nationality. One of those incidents occurred when the 150-ton fishing boat Tonan Maru that had departed from Naha in April, 1951, sought shelter from rough weather in a port in Taiwan. The Tonan Maru was then seized twice by Taiwanese authorities on the grounds that it was a vessel of unidentified nationality, and its 42 crew members were held in custody for a total of three months. It was reportedly also shot at when seized for the first time. The course followed by the Tonan Maru. Seventy-nine year-old Yoshirou Matsumoto and 78-year old Zensaburo Arakaki of Itoman City, both crewmembers back in 1951, talked publicly about that incident for the first time. According to the two men, the Tonan Maru, which belonged to a fisheries company in Naha, left on a fishing mission scheduled to last three months. Matsumoto was a deck-hand and Arakaki worked in the engine room. Bad weather forced the Tonan Maru to seek refuge at the port on Orchid Island, a remote island located off Southern Taiwan, about 300 kilometers south-southwest of Yonaguni Island. They thought that such an emergency entry into Taiwanese waters would be accepted, but on the basis that it wasn’t flying a national flag, the Taiwanese side (then ruled by the Chiang Kai-shek’s Nationalist government) judged that the Tonan Maru was an unidentified vessel and seized it after firing at it. Fortunately, no one was wounded, but the crew was kept in custody on board the ship for a month while the captain was interrogated. They were released once cleared of the suspicion of smuggling, but they were seized again when the Tonan Maru made a stop at Kaohsiung City to take on stocks of ice, and the boat was kept in custody for a further two months. From there, the Tonan Maru continued its fishing operations, working from Hong Kong, before finally returning to Okinawa four-months behind schedule. The Taiwan Strait had been close to becoming the scene of conflict between the Chinese Nationalist government and Chinese Communist Party since 1947.